Trends in kitchen designs, like most industries, come and go and so keeping up to date in 2018 could prove a struggle for some. However, we’re here to ensure you stay ahead of the rest with the key changes this year. With colours, counter top materials and door designs all changing, these main details have been taking the kitchen design world by storm and we’re taking a deeper look into just what 2018 is bringing in the way of trends. For the past decade or so, we have been obsessed with lighter colours including whites and creams and these hues have been dominating kitchens worldwide. These colours and the ongoing trend of wood finishes have been popular options simply because they make our workspaces feel brighter and warmer, however, these trends are now evolving! Darker colours are currently dominating the industry, with two-tone colours becoming increasingly more common as a result. Two-tone designs typically feature light colours that are combined and contrasted with a darker colour – for example, if you choose to have a dark grey countertop, you could contrast this with white cupboards or walls to create the two-tone effect! If you want a dash of colour, carefully choosing the colour theme of your kitchen appliances can really make the room pop! Through matching appliances, you can add a little more to the overall colour palette and something unique to your kitchen. Ceramic doors offer an ultra-modern look for kitchens, and their versatile design cam add an element of charm to your kitchen. Some of the most advanced ceramic materials maintain a high level of durability, while offering a unique texture which can truly help to set a modern kitchen apart. Its simple look however should not be disregarded, as it can highly complement a matte-finish kitchen, while remaining striking. For an extra unique option, opt for a ceramic door with no handle! High gloss kitchens have been available for many years but you could now opt for a matt look …… The high gloss lacquered doors have monopolized and enjoyed the wow factor for the last 20 years but satin laquered matt doors doors provide a beautiful understated and classy look instead.
. While a glossed countertop can appear extremely attractive when kept up, particularly when opting for quartz material, the potential for smears on the work tops makes it harder to keep on top of, especially if you’re someone who likes to spend a lot of time in the kitchen or you’re constantly on the go. 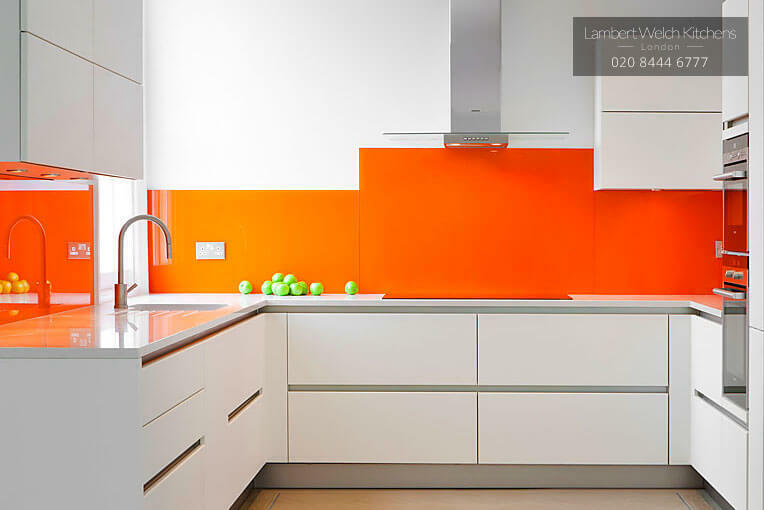 Gloss has been substituted for the likes of ceramic, laminate or marble-effect which are all far less hassle to keep on top of when it comes to maintenance. Choosing the perfect counter top to finish off your kitchen can be a difficult task. With so many options and the constant change of trends it’s hard to decide what’s right and what’s hot this summer. First up is quartz; this granite alternative has the same qualities as your natural rock finish, however it goes one better and strengthens granites weaknesses. You won’t need to worry about resealing your worktop, and fear of staining your counter top is long gone. This sleek alternative is perfect for any modern kitchen enthusiast and can come in many different colours and patterns to suit, as the flecks of other materials within the natural quartz such as glass and metals can produce a stunning look in your home. Another trend to be on top of this summer is the look of an integrated sink in your counter top. The smooth finish that leads from your quartz counter top to your sink gives your kitchen that extra bit of personality and a more modern finish. Furthermore, counter tops that give themselves individuality are in. With a variety of finishes, each counter top is one of its own, giving your kitchen its own identity. If you follow these trends you can be sure that your kitchen will pop this summer and all with its own unique but timeless look. Dark colours with matte-finish cabinets and quartz countertops with integrated sinks are the look you will want to achieve to keep up with the trend and have a gorgeous kitchen for your summer this year.